A horse’s reins are often associated with the steering wheel of a car, yet they function quite differently. Unlike a car a horse is thinking mode of transportation can learn to be ridden without constantly receiving signals from the rider’s hands. Once a horse can be ridden with little or no rein contact she demonstrates her ability to maintain a consistent frame and gaits on her own. 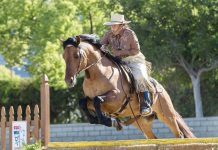 Riding on a loose rein also exhibits the natural progression of training for many disciplines such as western pleasure, reining, hunter under saddle, and trail. Showing a horse on a loose or light rein is advantageous during competition because it exhibits a higher degree of difficulty. Another way to refer to loose-rein riding is self-carriage, this state in which a horse is able to maintain a consistent frame and steady gaits on her own. 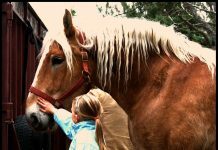 The foundation for self-carriage is built upon a balanced rider with soft hands, and a solid understanding of rider-to-horse communication, and a horse that has the strength and ability to carry herself in a relaxed and balanced frame. However, the rider is the cornerstone of developing self-carriage in the horse. Using weight, seat, posture, and leg aids you permit and encourage self-support from the horse. Weight should be carried evenly over both seat bones and both stirrups. Whether your horse is traveling on a straight or curved path, your pelvis should be symmetrically positioned over your horse’s spine. Mobility in your seat allows your hips to flow with your horse’s natural movement so your horse can relax, elevate her back, and engage her hind end. The core of your position is a tall yet relaxed spine. Proper ear-shoulder-hip-heel alignment is essential for you and your horse to work in balance. Use even leg pressure whenever necessary to ask your horse to take long deep steps with her hind legs. The more athletically she uses her hindquarters the more able she’ll be to achieve and maintain self-carriage. 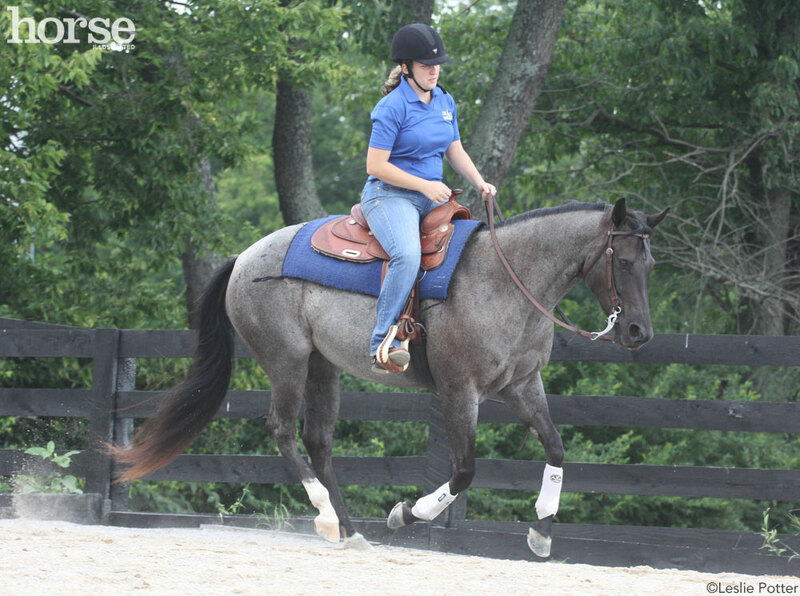 Also teach your horse basic cues; legs play a role when it comes to guiding your horse with fewer rein cues. Cue her to bend and follow an arced path with your inside leg at the girth and your outside leg slightly behind the girth. In addition to offering support through the natural aids, the rider needs to instill confidence in the horse. It takes time for a horse to acclimate to contact-free riding, especially if she’s used to relying on the rider’s hands for guidance. If the concept is new for your horse, introduce it slowly – a few strides at a time – to prevent her from feeling lost when the support suddenly disappears. Slowing down, speeding up, and drifting are signs that your horse is feeling insecure and needs to feel reconnected to get her bearings. You may find yourself going through rein-contact withdrawal too. Feeling out of control at first is natural if letting go of your horse’s mouth is unfamiliar territory. Make the transition from with contact to without easier on your horse by making sure she has the physically strength she needs to carry her own weight and yours without help. A strong hind end and developed core muscles are essential for your horse maintain hind end engagement and balance. If you find you’re constantly picking up the reins to reposition or rebalance your horse, she is probably too weak to stay in frame. Proper conditioning will make her better able to maintain a consistent frame and steady gaits on a slack rein. The paint in the video looks so “UnNatural”. Why is it carrying it’s head so low. It looks like it is not comfortable with what it is doing. Even the gaits look all wrong to me. PKL- That is that western pleasure crap, they want the horses heads glued to the ground and the choppy looking 4 beat lope. it was not a good example. I agree no horse should have to walk or preform that way. Thank you “X” for your help. I am going to look up the links provided.